PE-B305 part number from Pasternack is a RG59 Type coax cable that is flexible. Pasternack PE-B305 flexible coax cable is 75 Ohm and has a PE dielectric. Our PE-B305 coax is constructed with a 0.305 jacket made of PVC. PE-B305 coax has a shield count of 2 and the maximum frequency for this Pasternack cable is 1,000 MHz. 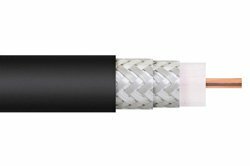 PE-B305 coax cable has an attenuation at 1 GHz of 9.2 dB and a maximum power of 52 watts at 1 GHz. Pasternack RG59 Type coax cables are part of over 40,000 RF, microwave and millimeter wave components. PE-B305 cables and our other RF parts are available for same day shipping worldwide. Custom RF cable assemblies using PE-B305 or other coax can be built and shipped same day as well.